Bluebush is a large-scale target area located 50 kilometres to the northeast of Newmont Mining’s world-class Callie Gold Mine. Bluebush includes several highly prospective prospects including Capstan, Indefatigable, Hornblower and Wild Turkey. Current activities are focused on the Capstan prospect. Capstan is a 22km x 8km sub-area of the Bluebush Project, falling within the Trans-Tanami Fault Zone. In-fill aircore drilling and two co-funded diamond drill holes are planned to refine targets for a systematic RC drilling campaign before the end of the 2018 field season. The interpreted folding and faulting complexity and geochemical anomalism of the Dead Bullock Formation (host rocks of Callie) highlight the prospectivity of the area. Numerous structures have been interpreted at Capstan with associated soil and shallow drilling anomalism. Approximately 95% of Capstan is undercover and surface sampling has only been effective in very limited areas in the north and south of the prospect. 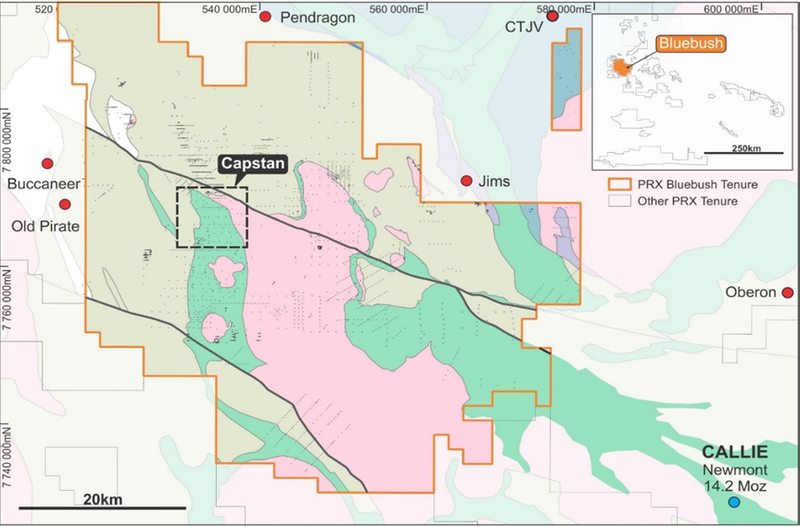 Drilling in the second half of 2017 at Capstan defined bedrock gold anomalism over an area 8km long which included five key target areas.